Join Cazenovia College for a semester-long study abroad program in Nagoya, Japan! Students will enroll in Nagoya Gakuin University's Institute for Japanese study to learn both Japanese language and culture in a hands-on environment. From day one when you meet your Japanese conversation partner and move into the convenient International Seminar House, you'll be immersed in Japan but given all the tools to enjoy yourself and encounter everything possible during your time. Nagoya is a moderate-sized city conveniently located in central Japan, an hour and a half by train from Tokyo and a half hour from Kobe, Osaka, Nara and Kyoto. 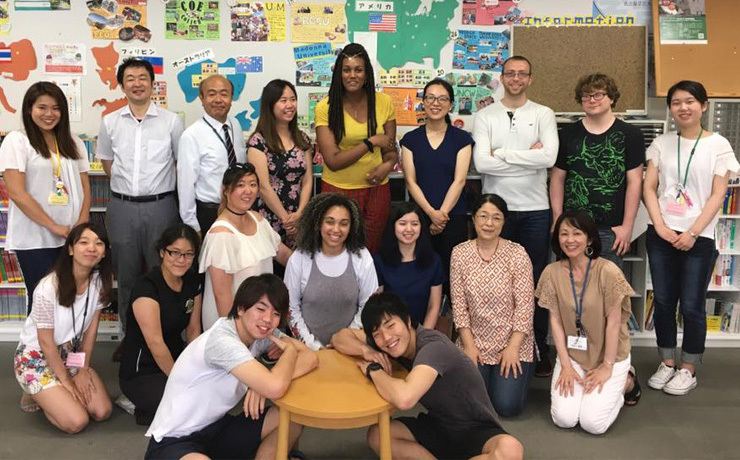 This program wants to get you out of the classroom and participate in both traditional and modern Japan. Previous field trips have included an anime studio, professional baseball games, a Toyoto factory, tea ceremonies in traditional gardens, a Cosplay conference, ancient temples and bookstores filled with manga. Organized trips to both Tokyo and Kyoto will help you encounter these great cities with knowledgeable tour guides. The Nagoya Program is a cooperative program between Cazenovia College and Nagoya Gakuin University (NGU). Participating students will take classes at NGU's downtown campus. Due to an exchange agreement with Cazenovia College, all NGU credits transfer automatically to Cazenovia College and the curriculum is designed to ensure that students do not fall behind in most academic programs by participating. This international study experience takes place during the fall semester and is designed primarily for students who are in their junior year, though students who are seniors can also participate. The program is selective and students must complete an application process. The Japan Program is subject to sufficient student interest and other factors that might affect the student experience abroad. Participating students remain registered as Cazenovia College students and take fifteen credits worth of classes through NGU's Institute for Japanese Studies. Language and culture classes are required of all participants but additional classes will be chosen from a list. Japanese Language is taught in Japanese but all other classes are taught in English. All participants must have taken at least two semesters of college-level Japanese or demonstrated comparable proficiency in an approved exam. Participants will live in Nagoya Gakuin University's International Seminar House and will take lunches at the campus dining hall. Other meals can be prepared in kitchen facilities in the Seminar House. Currently, a student visitor who is a U.S. citizen living in the U.S. is not required to have a visa to live in Japan if the duration of the stay will be less than 3 months.